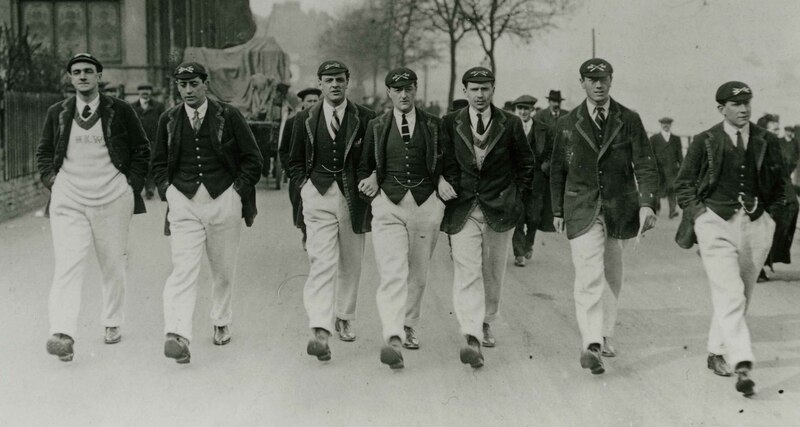 Until the 1939-1945 War, Tideway Week was a very big spectator event every day and police were needed to keep the crowds out of the way of the crews. 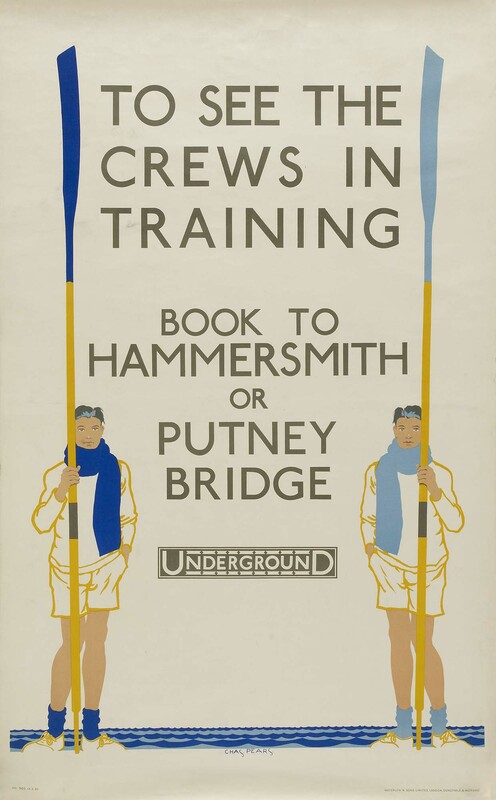 This London Transport poster of the 1930s reflects the interest that a well-informed general public had in the Oxford-Cambridge Boat Race. Today sees the start of Tideway Week, the last five days in the long run-up to next Saturday’s Boat Race Day. While the squads had long been in training, twice a day, six days a week, the countdown to the races officially started on 9 November 2017 with the Presidents’ Challenge. 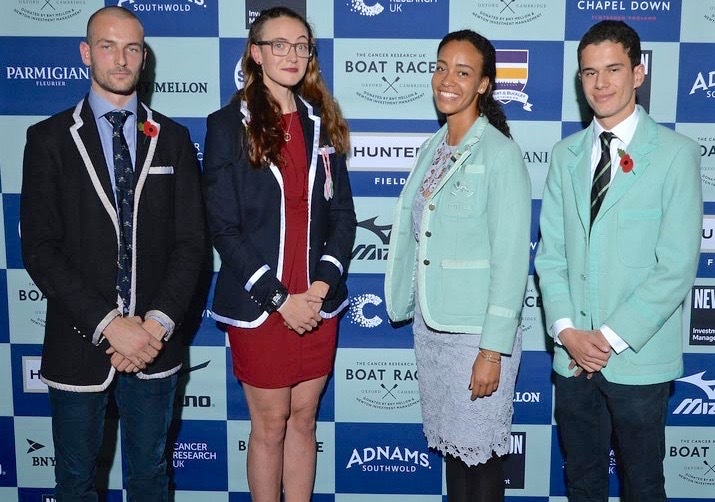 The President of the Boat Club that lost the previous time issues the traditional challenge to their opposite number; so Oxford’s Katherine Erickson challenged Cambridge’s Daphne Martschenko, and Hugo Ramambason of the Light Blues challenged Iain Mandale of the Dark Blues. Left to right, Mandale, Erickson, Martschenko, and Ramambason at the 2018 Presidents’ Challenge. Picture: The Boat Race Company. 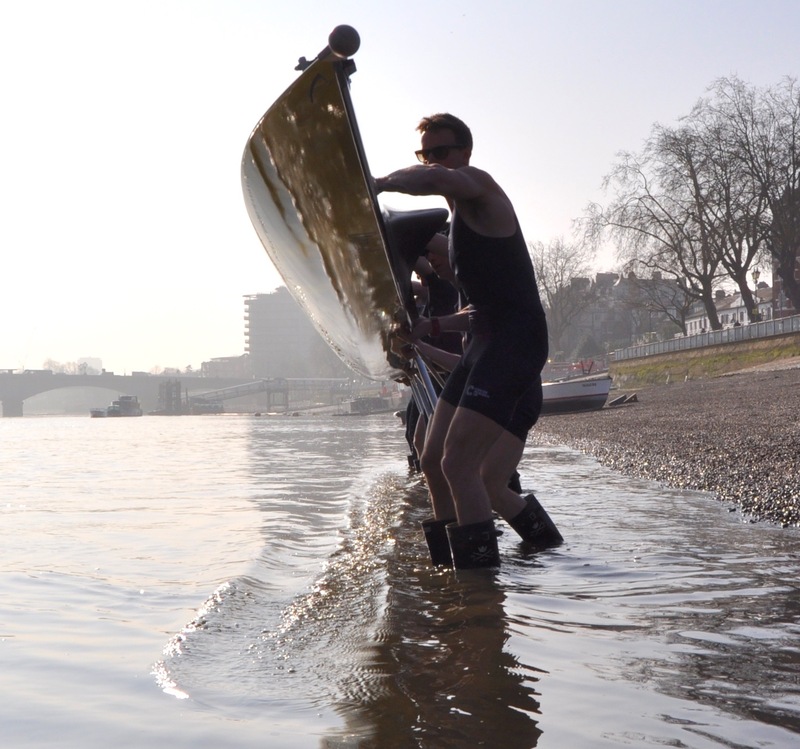 The next public events on the long road to Putney were the Trial Eights in December and January. These were not contests of Light Blue v Dark Blue, they were intra-university races for the men’s and women’s crews, Oxford racing Oxford, and Cambridge racing Cambridge. Here, the last 16 rowers and last two coxswains who are candidates for each of the men’s and women’s Blue Boats battle it out, usually in theoretically matched crews, all hoping to impress the coach who has to make the final selection. 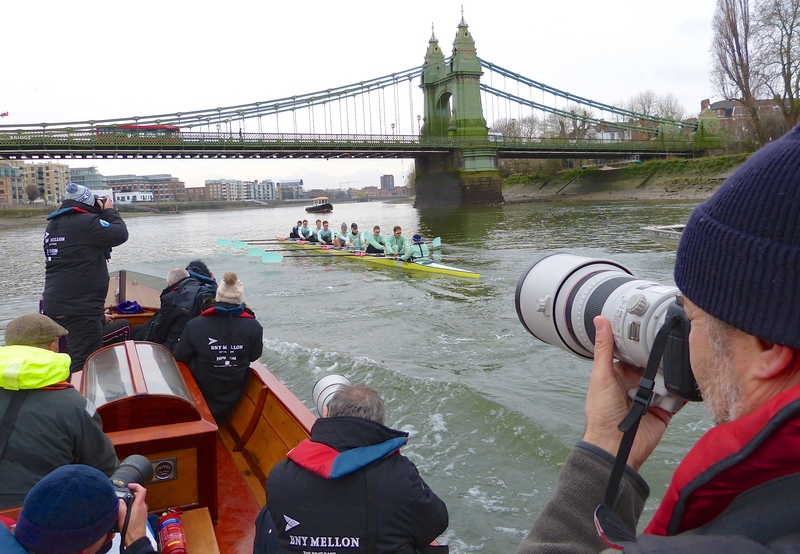 The last 18 Cambridge men battle it out under Hammersmith Bridge last December. Picture: Alastair Davidson @A23Alastair. 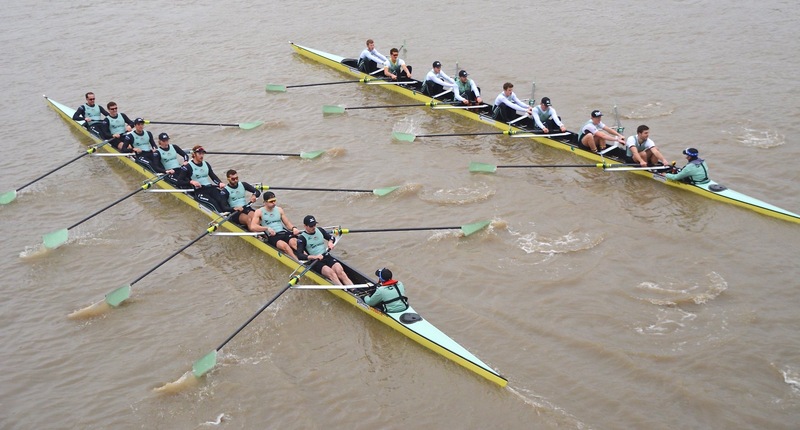 In late February and early March, the Club Fixtures were held, a series of races in which top domestic (and, in some years, foreign) crews race potential Oxford and Cambridge crews over the Putney to Mortlake course. 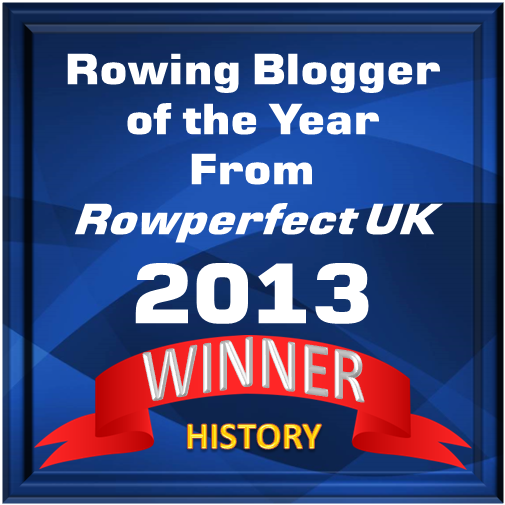 They are both a selection test and a provider of key race practice. 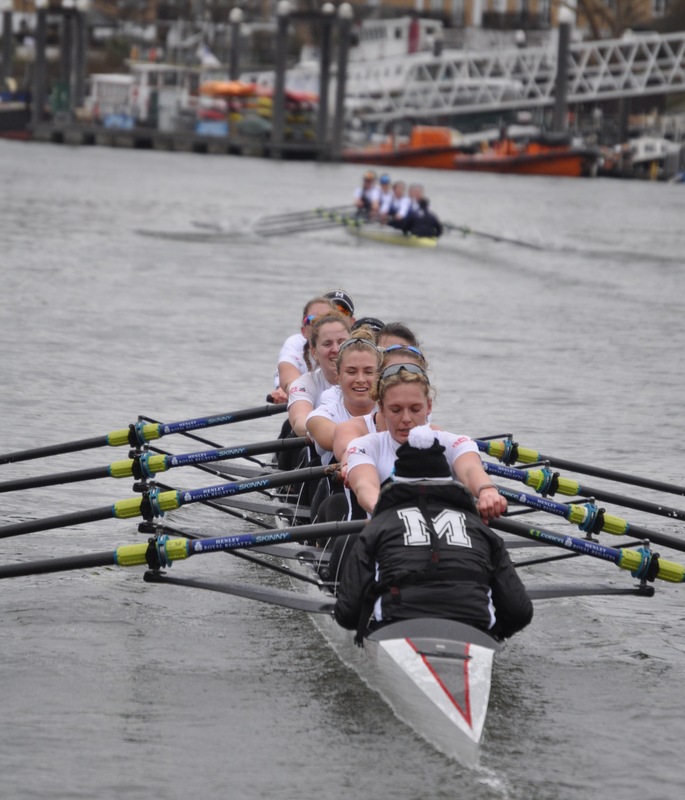 The Oxford women (in the background) were victorious in their fixture against Molesey Boat Club on 4 March. The Crew Announcement, held this year on 26 February, is a ‘media event’ held somewhere photogenic (this year, London City Hall) where the Blue Boats are officially announced and the crew members are individually weighed in a slightly undignified ceremony, and where the coaches try to answer questions without saying anything. The bow men weigh: Oxford’s Iain Mandale and Cambridge’s Patrick Elwood. this is when the squads will have moved to London to begin final preparations. Schedules typically include media outings, press commitments, fine-tuning the crew through short training sessions and relaxing ahead of Race day. Although the rowers may have been living in or near Putney before the start of Tideway Week, they will now have the added pleasure of having the press and photographers observe their every outing in the last few days before the event that will, for some at least, define their university years. The physically hard training is now over and time is taken up by relatively gentle paddling and by extremely serious eating. 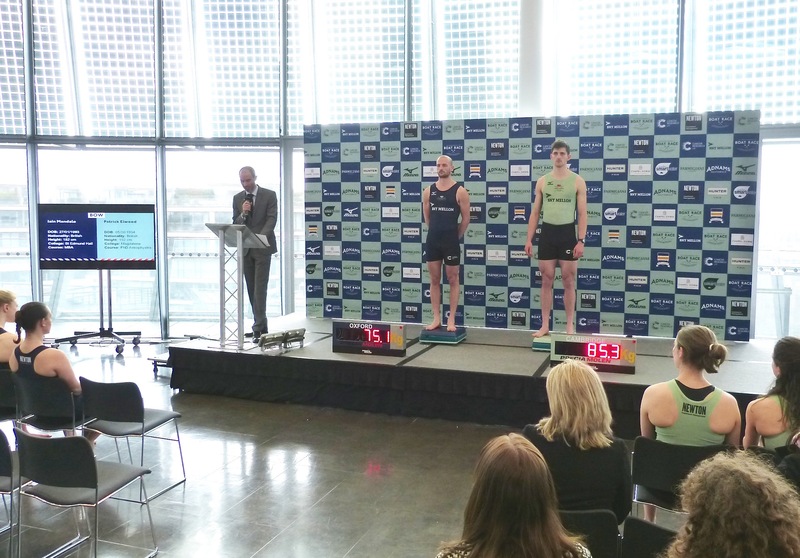 Tideway Week, 2016: Cambridge meet the press. It is this final period of preparation which finds the crews most in the public eye yet much of the time cocooned from the attention and pressures which are upon them. Boris Rankov, Oxford’s ‘grand old man’ in the number five seat [in 1982]… says that these two weeks are the best part. ‘Eat, sleep, row’ is how he sums it up… [1982 Oxford cox, Sue Brown] says that the number of people involved in putting on the race is almost unbelievable, but you can go through the last fortnight almost unaware that there is so much activity around you. In the 35 years since Chris wrote this, the ‘unbelievable’ number of people involved in putting on the race could well have doubled or trebled, but I imagine that the crews are even more protected now than in the past (even if it impossible to cocoon them from the Internet). 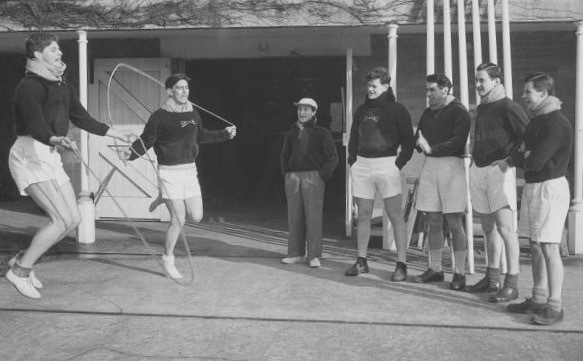 All this is a little modern for Hear The Boat Sing, so, before we go into contemporary mode for the next week, we will go back in time and see how much – or how little – Tideway Week has changed. 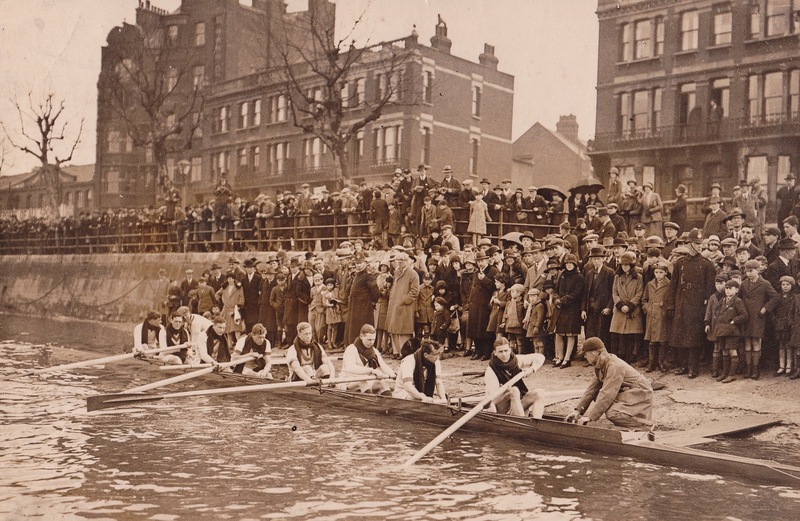 Oxford boating from Putney, Tideway Week 1930. 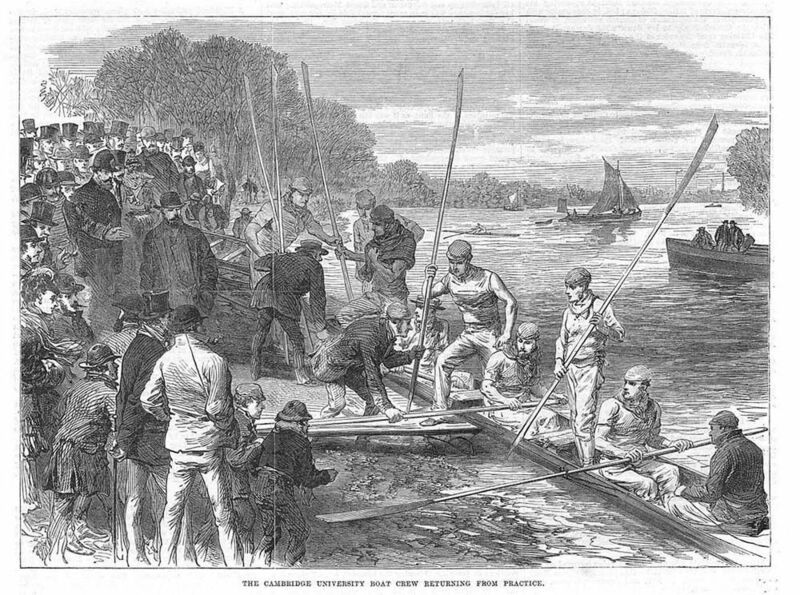 Cambridge boating from Putney, Tideway Week 1868. 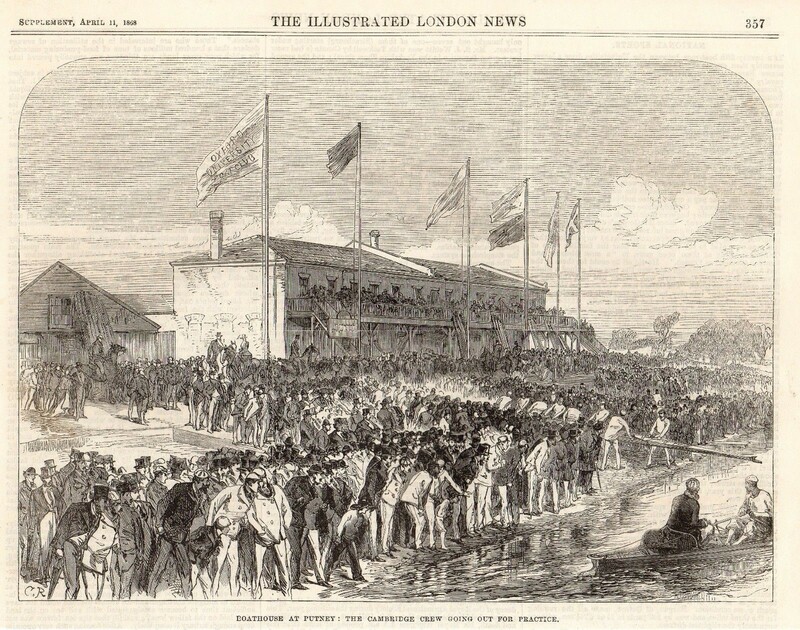 Both of the above pictures show the crowds that, historically, thronged the Putney Embankment during Tideway Week. Many knew the names of the crew members and most firmly supported one university or the other – though usually for no logical reason. For example, the impoverished East End of London was traditionally for Cambridge as many road signs in that area pointed to the home of the Light Blues. Oxford returns from practice, 2017. 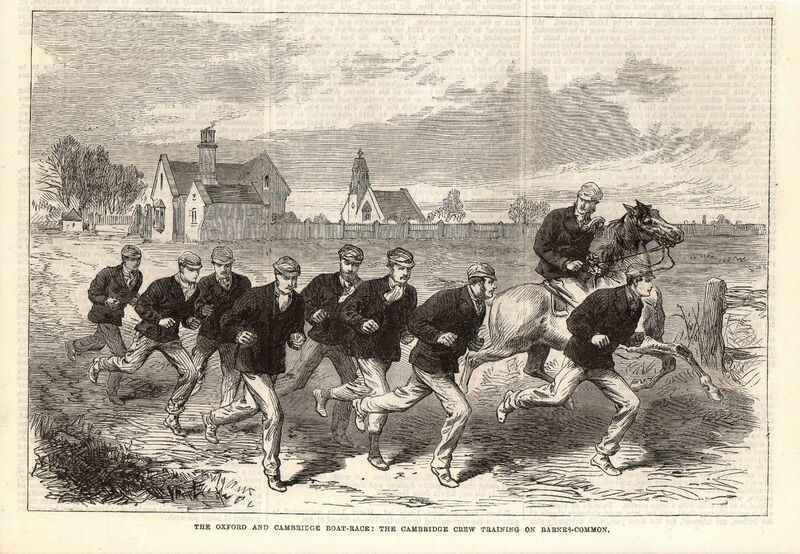 Cambridge returns from practice, 1870. 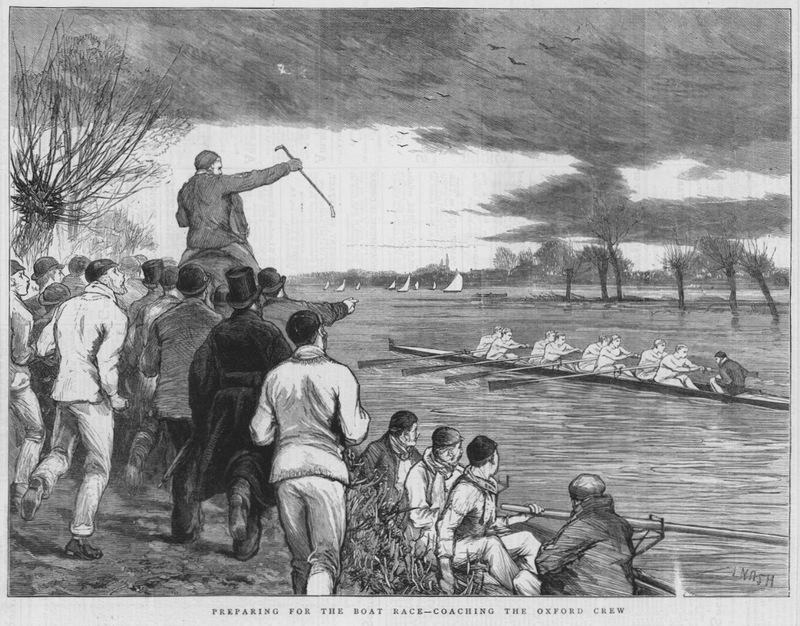 Coaching Oxford on the Tideway, 1876. 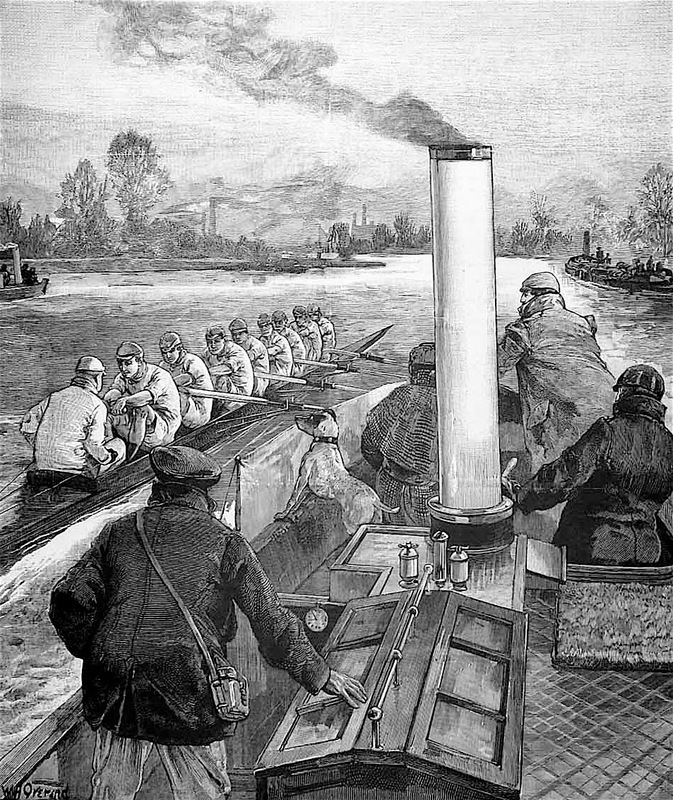 Coaching Cambridge on the Tideway, 1892. Oxford at Putney, 1913, walking past the Star and Garter. 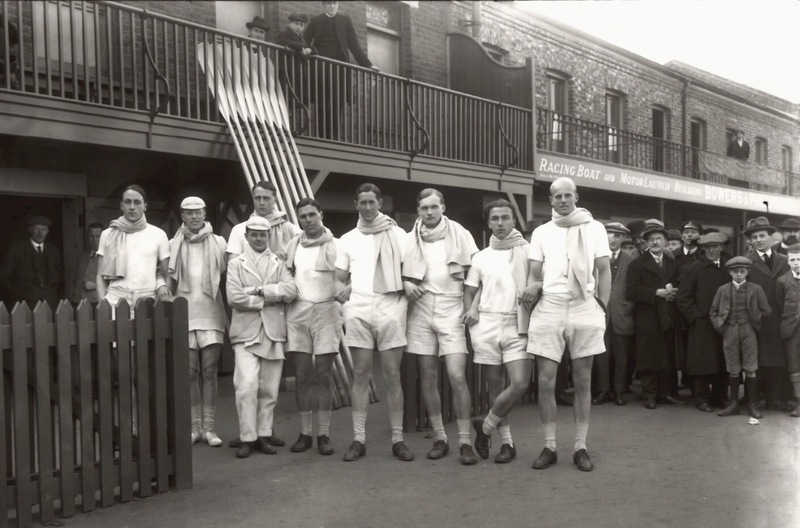 Cambridge at Putney, 1920, outside Leander’s London boathouse and the boatbuilders, Bowers & Phelps (now the site of King’s College School BC and of HSBC BC). 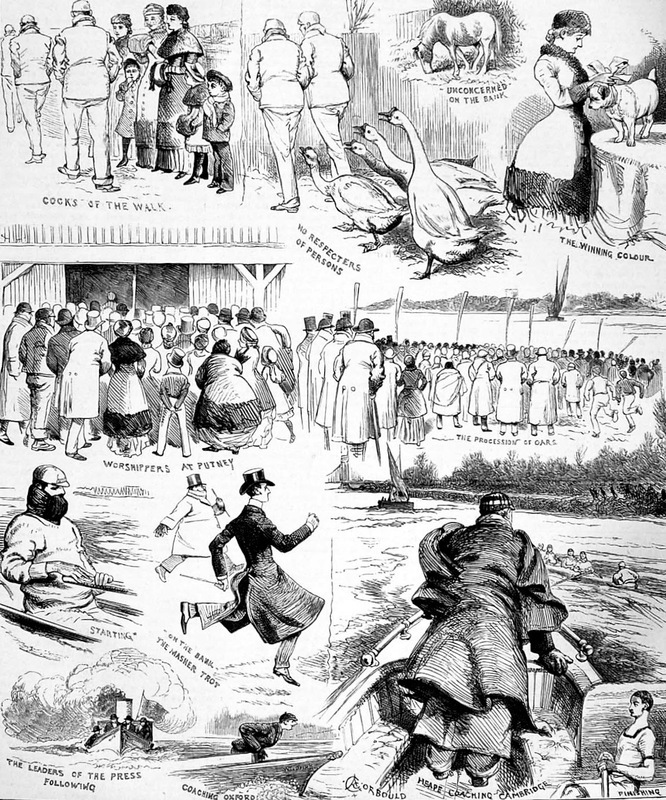 “The Illustrated London News”’ impression of Tideway Week, 1883. Apropos the photo of the University Presidents at the Boat Race challenge at the beginning of your article. Since when did the Oxford blazer begin sporting a white trim ? I seem to remember them, as in the 1913 photo and until quite recently, with just an imperceptibly lighter shade of Oxford blue trim. The blazers in question are the Isis and Osiris blazers for Mandale and Erickson respectively, since both have previously rowed in the reserve crews. They don’t technically become Blues until after the race.